Divekick is a comedic parody of fighting game motifs and contains many humorous references to games (especially those in the Street Fighter franchise) as well as inside jokes from within the competitive fighting game community. 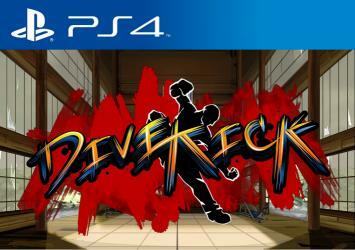 Unlike most fighting games which are played using many buttons for many different kinds of movement and attacks, Divekick is played using only two buttons, Dive and Kick. Pressing Dive causes the character to perform a vertical jump, with each character having different jump height.